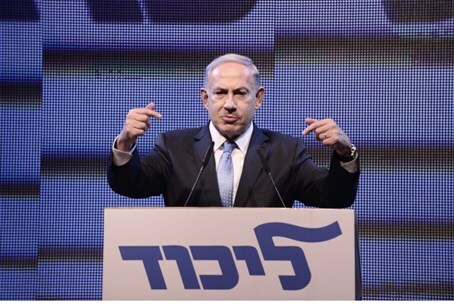 Channel 1 poll gives Jewish Home 15, possible Netanyahu coalition 69; Yisrael Beytenu down to 7. The latest election poll shows Likud down slightly at 25 seats – still one more than the Labor party with Yitzhak Herzog and Tzipi Livni. Jewish Home receives 15 MKs, according to the poll, which was conducted by Teleseker for Channel 1. Yair Lapid's Yesh Atid receives 9 and Moshe Kahlon's Kulanu gets 8 seats, as does United Torah Judaism. Avigdor Liberman's Yisrael Beytenu receives just 7 seats in the poll – and is apparently suffering as a result of the investigation into corruption that centers on MK Faina Kirschenbaum. Meretz also receives 7, less than it has been getting in polls recently, and Shas defector Eli Yishai's Ha'am Itanu doesn't make it past the threshold. The total number of MKs in a likely Netanyahu religious-right coalition, based on the poll, is 69. This is 8 more than the precarious 61 that Netanyahu can muster in the outgoing Knesset. A coalition in which Jewish Home is Likud's senior partner could see Naftali Bennett in the Defense Minister's position in the next government. This is the second poll to show Likud gaining ground over Labor. Analysts said after that poll, which showed Likud at 26 seats over 23, that the Likud primaries had been a crucial factor in driving the public rightward.